You may have an intuitive understanding that you want to acquire as many users as you can, retain as many users as you can, and have the highest possible virality coefficient. What you might not be so sure about is the relative importance of these three factors. So to address the former issue, let’s model several scenarios and visualize the results. 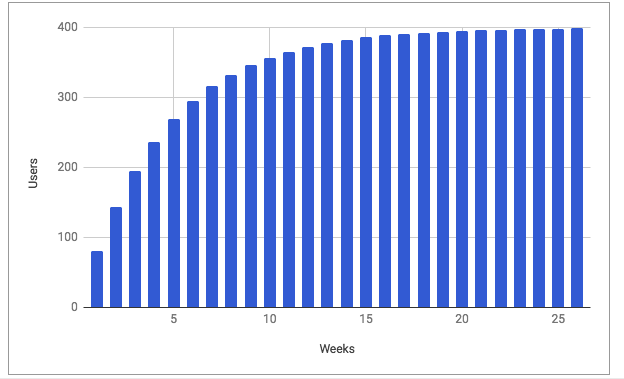 Here is the spreadsheet I built to illustrate the growth dynamics. Feel free to download it or save a copy to the Google Drive and play with it. Of course, the reality is much more complex than this oversimplified model but it will suffice for our purposes of illustrating key patterns. Let’s run a few scenarios to get an intuitive grasp of the interplay of these metrics. 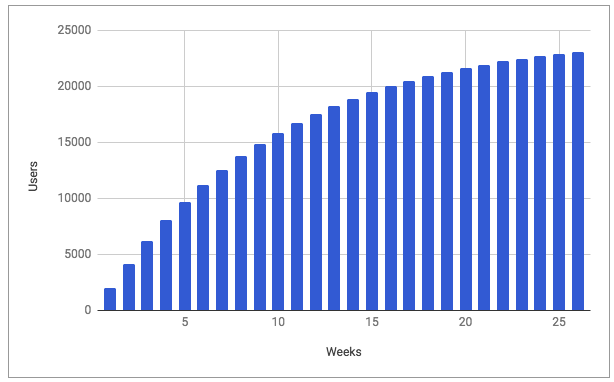 Let’s start with the simplest scenario and assume that we can only acquire 100 users per week. This limitation might be due to our budget constraints or the number of friends we have. Let’s also assume that our product is not viral at all, i.e., virality coefficient = 0. In other words, nobody recommends our product or nobody sufficiently trusts these recommendations to sign-up. 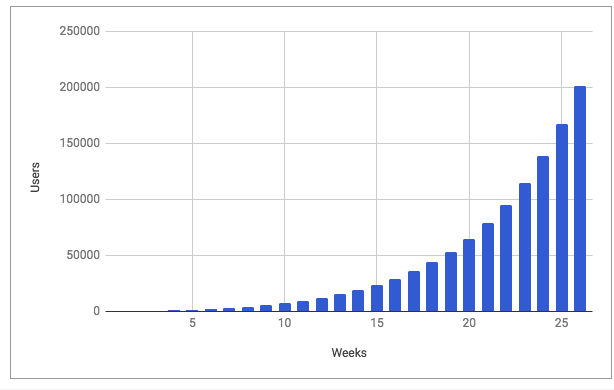 We end up with 2,600 users by week 26. 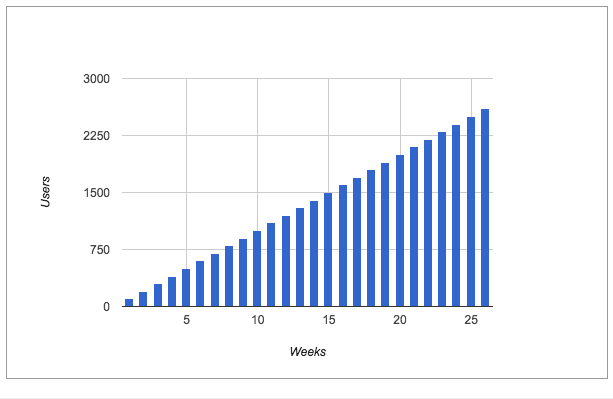 Not quite a hockey stick, but a solid linear growth rate. How about viral growth? You might have read stories about Facebook, Twitter, and Hotmail growing this way. So let’s see how this variable can impact our growth prospects. Let’s still assume that we lose 10% of our users. But let’s also assume a virality coefficient of 0.4. This means that when we acquire 100 users via our regular customer acquisition efforts, we get additional 40 more through the viral loop. Now, what if we could create a truly remarkable product experience leading to a virality coefficient of 1.0? In other words, for each acquired user, we would get another one “for free”. 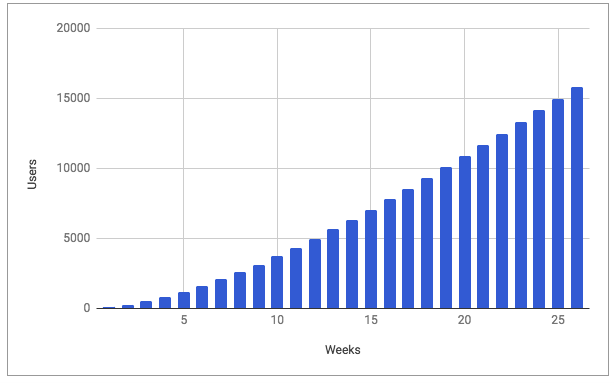 Whoa, we’ll have 15,823 users by the end of week 26 with the same acquisition rate of 100 users per week and with the same churn rate of 10%! What if could get our virality coefficient above 1? Let’s say we could achieve 1.2. Here is how it might work: each user sends an email to five friends and, on average, 1.2 out of five sign up. 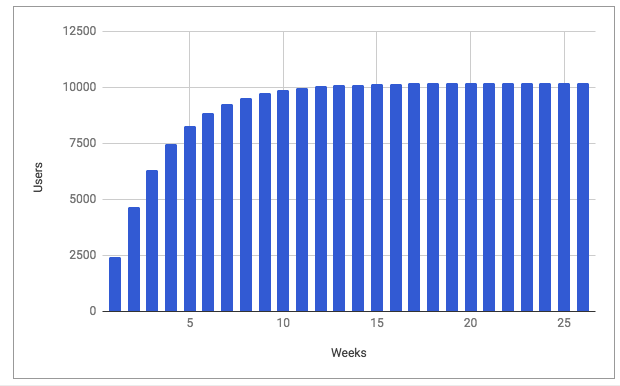 Still assuming the same churn rate of 10%, we will end up with 201,730 users by the end of week 26. Now, this is much more exciting, isn’t it? Marketing professionals have been talking about “word-of-mouth marketing” for decades to refer to marketing that your customers do for you. In a way, the “viral loop” is simply re-branded “word-of-mouth marketing” with more emphasis on deliberately designed product features that reinforce virality. Of course, achieving this type of virality would require an outstanding product and remarkable marketing. In fact, very few companies were able to achieve this kind of growth. The practical takeaway is that product experience and marketing and highly interrelated. When users love the product, marketing campaigns become much more effective as acquired users stick around and bring even more users in. How do we decide on which metrics to focus on? One way to do it is to benchmark our metrics against market-averages. As you can see our retention is lagging behind the competition. Let’s estimate how it impacts our business by plugging these numbers into the spreadsheet. 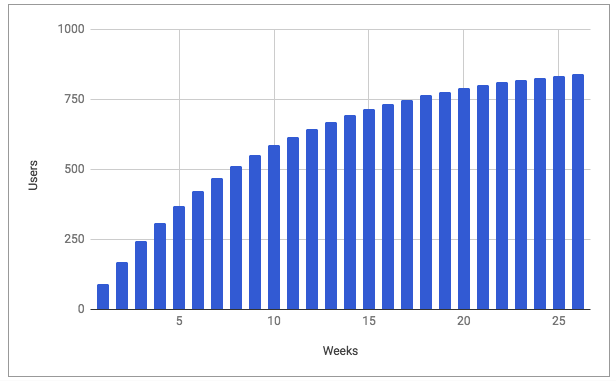 An average competitor can expect 23,105 users by week 26. We can expect only 10,207 even though we acquire users at a higher rate. What if we could improve our retention rate from 70% to the industry standard of 90% while keeping all other metrics at the same levels? In this case, we could expect 36,758 users – more than 3x the original number. So would we be able to confidently set the goal of improving retention rate in this case? What’s the root cause of the low retention rate? E.g. the product itself, the quality of onboarding materials and customer support, the pricing strategy or marketing effectiveness. What exactly are customers unhappy about? 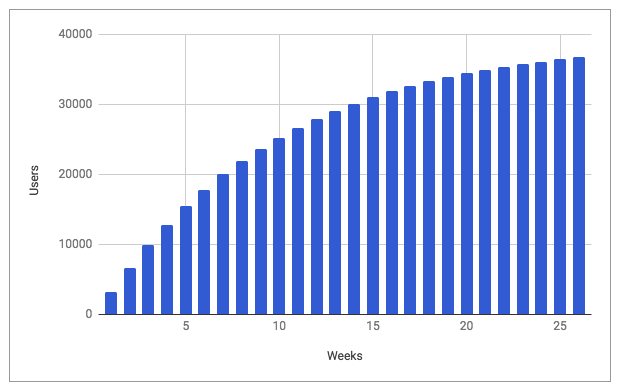 How much investment is required to improve retention? How is the market evolving – will this still be important in the future? Improving retention and virality coefficients can have a substantial effect on growth, independent of customer acquisition. But it doesn’t mean that acquisition numbers are irrelevant. On the contrary, the rate at which you acquire users will often be the number one factor determining future success. Certain companies might be unable to improve the churn rate in the short-term because of certain fundamental issues with the product that would take months to address. Certain teams can substantially improve the acquisition rate but be limited in how much they can affect churn rates and virality. In other words, the answer is “it depends”. So, the most important takeaway is that modeling your specific situation will allow you to make much better decisions. Today we discussed how changes in acquisition, retention, and virality metrics impact the number of active users. Next time, we’ll assess the dollar impact one user makes on our business. 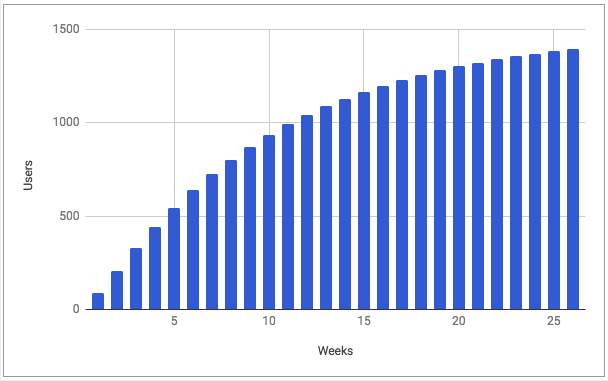 To do it, we’ll learn to calculate and use another metric: customer lifetime value. Keep reading.